Godenko recalls the highlights of her competitive career, and offers her perspectives on the challenges of coaching today’s gymnasts, in this International Gymnastics Online interview. TG: I remember winning and losing, tears of happiness and tears of disappointments. I guess it’s a part of your experience before you know what needs to be done to make it through and get to the top. I feel that all my meets were my accomplishments, and some were just more valuable than others. My best competitive accomplishments were in the mid-1980s. My first international meet was a dual meet between Russia and Bulgaria in May 1983. I remember it very well because I got a perfect 10.00 on floor exercise. Somebody even yelled “Bravo!” I won the all-around, as well. It was very unforgettable to be highly recognized by the judges and win the meet. 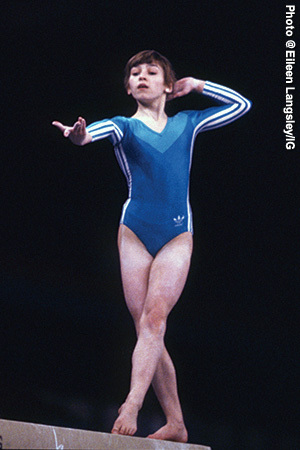 In May 1984, I won the gold medal in the all-around in an international meet in Sofia, Bulgaria. Two months later, I got two gold medals at the Friendship Tournament in Czechoslovakia, as a part of the Soviet team and individually on the uneven bars. I thought I’d done my best-ever bars routine. I caught my release moves and stuck my dismount perfectly, yet the Romanian gymnast did well, too. At the award ceremony, when my name was announced as a winner together with Daniela Silivas (of Romania), I was very happy that my team and country had another gold to claim. Domestically, at the (Soviet) Junior Nationals in 1982, 1983 and 1984, I got bronze medals in the all-around, all three years in a row. 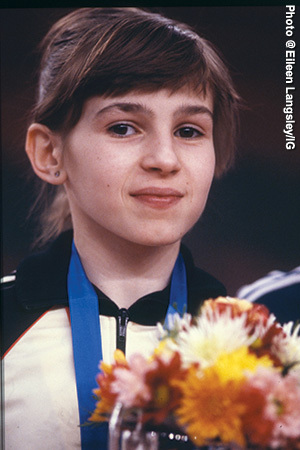 I also became the junior national champion on uneven bars and floor exercise in 1984 in Donetsk. I got another gold medal during the 1985 Spartakiada Games in Gomel. At the 1986 Summer National Spartakiada I got the silver medal with Russia’s team. In 1987 at the National Dinamo Championship in Almaty I got the silver medal in the all-around. Natalia Frolova got the gold. It was always an eager moment to show your new moves. At that last meet I had to try a new vault, a Yurchenko with one-and-a-half twist, and I made it. I did new tumbling passes on floor – a double layout and a whip to two-and-a-half-twist to punch front. It felt good. We were getting ready to be even stronger for the Olympic year (1988). TG: I had several injuries, including a few knee injuries, through my gymnastics career, which I was able to recover from and get back on track on time. Yet the last knee injury (ACL) was before the 1988 Olympics. It prevented me from being able to achieve the dream goal of my life. I just did not have enough time to recover from it. My teammates – Yelena Shushunova, Yelena Shevchenko, Svetlana Boginskaya, Svetlana Baitova, Natalia Laschenova and Olga Strazheva – went to the 1988 Olympics in Korea. They won the gold as a team, and I was very happy for them. They well deserved it. IG: Which aspects of gymnastics from your time do you feel have been “lost”? TG: I’m not sure if it’s been “lost” completely, but it would be the virtuosity and the artistry. Let’s take a look at some gymnastics performances in the 1980s. Every international gymnast, from the Soviet Union, Romania, Germany, Czechoslovakia, Bulgaria, China and elsewhere, was trying to impress the crowd with virtuosic moves on any event. Skills were very innovative and interesting to watch. There was a lot more artistry in gymnastics performances during the floor exercise routines. 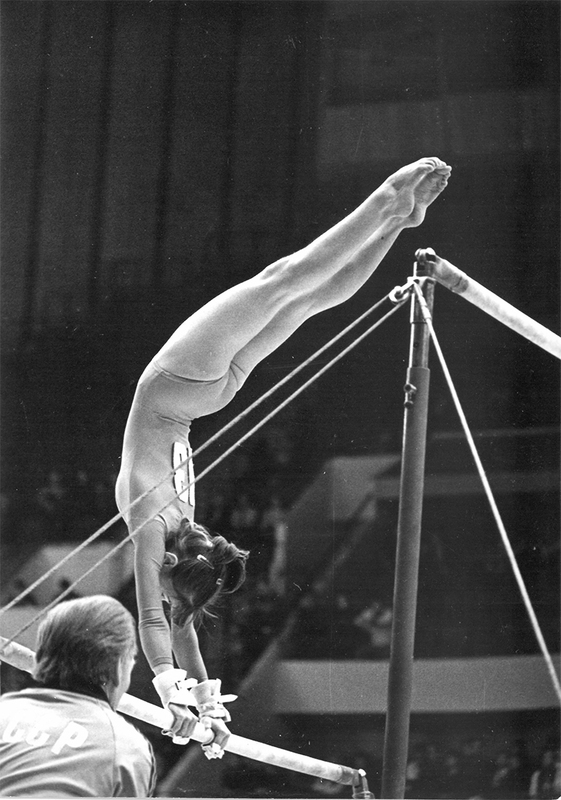 It was a different view of gymnastics – very elegant, very graceful, very stylish and very unique! IG: How do you feel it would be possible to “find” or restore that to today’s gymnastics? TG: It takes the coach and the gymnast to make it happen. When the rules are changing, coaches are trying to add more difficulties and more bonus to be very competitive on either the national or international level. Sometimes it leaves no room for artistry and virtuosity, which is very unfortunate, because gymnastics is a very beautiful sport. Many gymnastics clubs and coaches are helping the gymnasts to restore those aspects of gymnastics now. It shows in the performances of their gymnasts. Nastia Liukin is a great example. At the 2008 Olympics, her bars routine was extremely virtuosic and her floor routine was absolutely graceful. It’s great to see when gymnasts surprise us with unforgettable performances or new moves. It makes the sport very interesting to watch. TG: We happened to have a very powerful and knowledgeable coaching staff and also great choreographers, who worked with us all those years and made us who we are today. Every coach has a different coaching style, so we had to adapt to them when we were in training. I’m not afraid to say that I have a great understanding of the technical aspects of gymnastics training, based on my previous experience as an international gymnast. I’ve tried a lot of different skills during my career, plenty more of those specific drills on my own body. I knew which drills were more useful. Yet, I always liked the detailed work our coaches were giving us on different events. I respect their determination in making us to be the best, always with an individual approach. I believe I’ve adapted that well. Now, being a coach, I have an ability to impart that knowledge onto our gymnasts. I always explain every detail and make sure girls follow through and accomplish it every time on any skill, and on every dance move. It helps to increase the motivation and the desire for the gymnasts to learn, achieve and succeed. IG: Your gymnastics performances were exquisitely detailed – every body part in perfect position. What method or methods do you employ as a coach, so your gymnasts can also master even the simplest of details? TG: Thank you for the compliment. We always worked a lot on simplest details, making sure that our muscles’ memory will keep it that way, and we would look superb and very polished. Our training included plenty of different challenges, such as running, conditioning and lots of drills on every event, plus trampoline, ballet and flexibility, as well. Everything had to be very exact and nearly perfect. Details matter in gymnastics. Every step of the way has to be accounted for and thought through. Repetition makes it perfect, and the number of those perfect repetitions helps the gymnasts in skills as well as at competitions. It obviously worked for me. Now it’s time for me to share my training experience with our gymnasts. Many introduced skills are broken down to simple drills, just to make sure that every detail is taking care of, polished and memorized. Perfection is the key. TG: I moved to the U.S. in the summer of 1995. I always like a challenge. I had a job offer as a coach and choreographer in New Hampshire, and then I had another offer in Princeton (New Jersey). I did not think I would pick New Jersey, but Princeton area is incredibly beautiful and historical, so we stayed in the area and later opened our club. There are new challenges in life. Yet, it’s very rewarding to be able to establish our own gymnastics school, and obviously leave our own mark in sport. Our son’s name is Vlad, and he is very involved in gymnastics. He is double-flipping and double-twisting practically every day. He loves it! TG: American gymnastics has been very powerful for the past 20 years. A lot of former international gymnasts and coaches came to the U.S. with their innovative ideas to improve the sport. We (former international competitors and coaches) have been working, creating and developing even more drills, and more different ways for gymnastics training from our own coaching experience, so we can produce better gymnasts and stronger results. It worked and still works! American gymnasts claimed the Olympic all-around gold medal at the 2004, 2008 and 2012 Olympics – not bad at all! I would like to believe that the U.S. will continue to maintain a leading position in the world. Now, Valeri Liukin (1988 Olympic all-around silver medalist and high-bar co-gold medalist, and Nastia’s father/coach) is USA Gymnastics’ development team coordinator, and this should guarantee the increase in the number of young athletes in the U.S. No doubt they will be recognized in the world. Those girls are our “Future Stars” and big hopes for the country. And hopefully, Marta and Bela Karolyi, who brought up numerous world and Olympic champions, will continue to (help) leading the U.S. team to more international victories and gold medals. And let’s remember that we should never underestimate the rest of the world’s best gymnastics countries – Russia, Ukraine, Belarus, China, Romania, Japan, Australia, Germany and Great Britain. They too will be working even harder up to the next world championship and then the Olympic Games. Time will tell. It’s always a challenge to compete among the best in the world, and always will be.